Sometimes, you just need meat and potatoes. 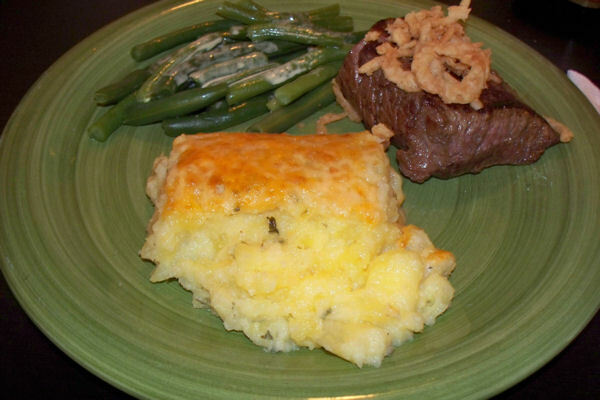 There are many simple options for meat that don't need much to be delicious, but most home cooks spend more time worrying about it than about the potatoes. As a result, potatoes usually wind up being boring and uninspired, which is where this recipe comes in. 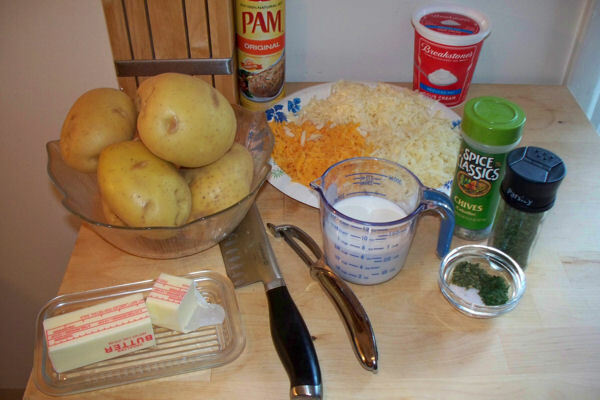 My three cheese baked mashed potatoes are creamy and cheesy, but are surprisingly low in calories. I use Yukon Gold potatoes, which require very little butter and no heavy cream to be silky smooth, and I bake them in a lasagna pan to maximize the surface area and make a crispy, delicious crust. 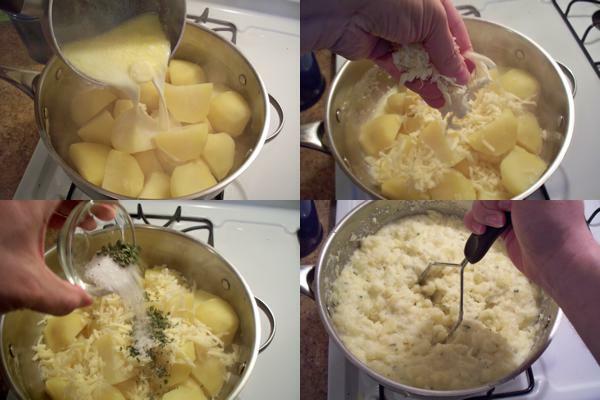 Once you realize how easy and awesome these potatoes are, you'll never want to use a bland box of flakes again. Preheat the oven to 400°. Peel and quarter the potatoes and place them in a large pot. Add lukewarm water to cover. 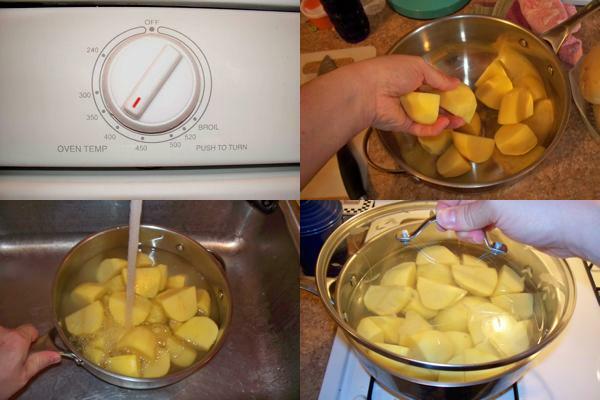 Cover pot and bring to a boil for 15-20 minutes until the potatoes are soft enough to mash. 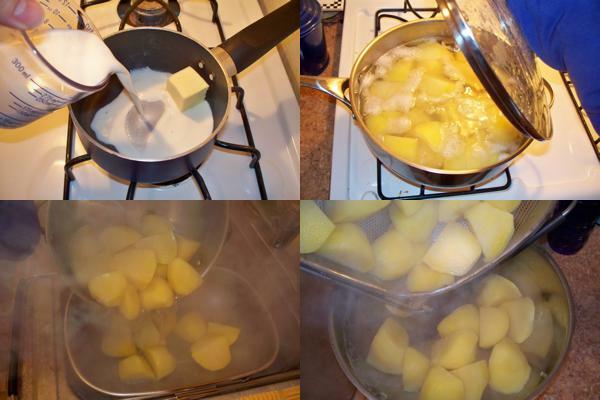 While potatoes are boiling, place milk and butter in a small saucepan over low heat. Let the butter melt, but don't let the milk come to a boil. Meanwhile, once the potatoes are soft, drain them and place them back in the pot. Add warmed milk and butter mixture, half the fontina and Gruyére, chives, parsley, salt, pepper, and sour cream. Mash together until it reaches the desired consistency. 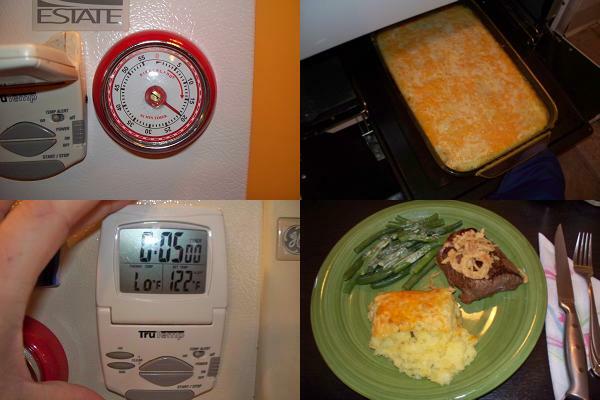 If the potatoes are underdone, you can add 10-20 minutes to the baking time to compensate. Spray a 13x9 baking dish with cooking spray. Spoon in the mashed potatoes and smooth them out with a spatula. Cover with the rest of the fontina and Gruyére, along with the cheddar. Spray a piece of aluminum foil that is big enough to cover the baking dish. Cover the dish, with the sprayed side down, and bake for at least 20 minutes. Pre-heat the broiler. 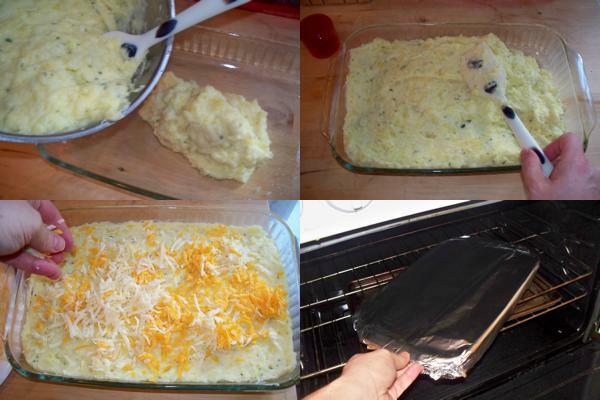 Remove the aluminum foil and set the dish under the broiler for 5 minutes, until the cheese forms a golden-brown crust. Let cool for 5-10 minutes before serving. Garnish with a juicy sirloin steak and fresh green beans.